Just your typical game of air hockey. Move the paddle using your mouse to hit the puck. 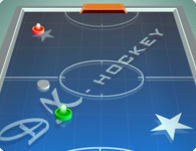 Use the mouse to move the puck in your area and try to accumulate seven points to proceed to the next level. The new version of popular table-sport game. Good graphic. Time for some epic Fingerhockey! Winter is coming, so stay inside and play with a friend! The aim of this game is to get a puck past the other player and into his goal, nice and simple. In this sports game, you will face a small duck in a tough and challenging game of Air Hockey. It may be cute, but this duck doesn't mess around! Head to the zoo and challenge all of the animals to a nice game of air hockey! Sure, they may be cheating and not using a paddle, but come on, their animals. Smash the puck with a powerful slap shot and score the game winning goal! Play table hockey against 8 different computer opponents. You're on the power play so score as many times as you can over the course of 3 periods. Enter the role as a suburban hockey goalie and save as many pucks as possible!